Here are ten facts about the central American country Panama. Panama is the most southern country in Central America, bordering Costa Rica on its north and Colombia on its south. Panama has a population of just over 3,300,000, making it approximately the 131st most populated country in the world. In 1907, its population was about 318,000 when it was the 122nd most populated country. Panama's official language is Spanish although a large number of Panamanians are bilingual with English being the most common second language. Panama is a democratic republic. Elections are held every five years to elect the country's President and Vice President. The last election was held in May 2014. Up to 1821, Panama was a Spanish colony, originally settled in the sixteenth century. Panama gained independence from Spain and joined the Republic of Gran Colombia in the same year, along with Colombia, Ecuador and Venezuala. The Republic of Gran Colombia was dissolved in 1830, and Panama and Colombia went on to form Neuva Granada (New Granada). It later became the Granadine Confederation in 1858, the United States of Columbia in 1863, and then the Republic of Colombia in 1886. After years of trying to become an independent nation, Panama finally achieved independence on November 3rd 1903 with assistance from America who wanted to construct the Panama Canal but couldn't do it while Colombia still had an input in the running of the nation. The treaty to construct the Panama Canal was signed on November 18th 1903 between Panama and the United States. Panama's flag is a rectangle split into quarters. The top left contains a blue star on a white background. The top right quarter is filled red, the bottom left quarter is filled blue on the bottom right quarter contains a red star on a white background. The white represents peace, blue represents purity and honesty and red represents authority and law. The blue star also represents the country's Conservative party and the red star represents Panama's Liberal party. The flag was designed by the son of Manuel Amador Guerro, the man who went on to become Panama's first President. 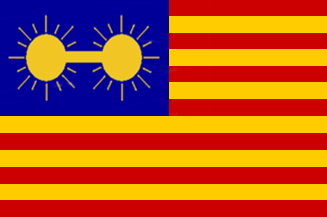 A proposed design of the flag (pictured below) was based on the design of the flag of the United States with the colour scheme of the Spanish and Colombian flags. The image in the top left corner of the flag is meant to symbolise the Pacific and Atlantic Oceans joined by the Panama Canal. It was designed by Frenchman Bunau-Varilla but was rejected because it was designed by a foreigner. Panama's official currency is the balbao. One balboa is equal to one US dollar. Despite having its own currency, all banknotes used in Panama are actually American dollar notes (it is now fairly common in Central American countries to have "dollarized" currencies). Panamanian balbao banknotes were produced in 1941, but were withdrawn after one week. Panama hats didn't originate in Panama. They actually originated from Ecuador. They became called Panamas they were shipped from Ecuador to Panama before being sent to their destinations worldwide, so people believed that they were actually from Panama. In centuries past, when hat-wearing was a more common past-time, the Panama was one of the most popular hats, and the export of these hats helped Elay Alfaro to finance his liberal revolution of Ecuador in 1895. Even today, the Panama is a popular hat, and if you're ever on a cruise ship in the Caribbean, you can spot many an American tourist wearing one. The Panama Canal is an important and busy trade and commercial route allowing vessels to cross from the Atlantic Ocean to the Pacific with relative ease. Records suggest that the idea to create a route across Panama was suggested back in the sixteenth century, but it was the French in 1880 who first tried to construct a canal linking the two oceans. Unfortunately, they made a bit of a mess of it and gave up in 1893 after losing almost 22,000 workers through disease and accidents. Gustave Eiffel, whose company designed and constructed The Eiffel Tower in Paris, was involved in some of the engineering plans for the Panama Canal, and nearly went to prison for his part in the French failure of its construction. The United States later began construction of a canal on May 4th 1904 and completed it in 1914, two years earlier than planned. From the start of construction up to 1979, Panama Canal and the area surrounding it (the Canal Zone) were under American control. They shared control with Panama from 1979 to 1999 and handed full control over to Panama in 1999. All vessels going through Panama Canal have to pay a toll. The toll is based on the type of vessel, its size and its cargo. The highest toll paid was $376,000 by the Norweigan Pearl cruise ship in 2010. I wonder how many passengers were wearing Panama hats on that cruise. The previous record holder was the cruise ship Disney Magic which paid $331,000 in May 2008. The lowest toll was 36 cents charged to Richard Halliburton who swam the canal in 1928. Not sure where he put his change though.